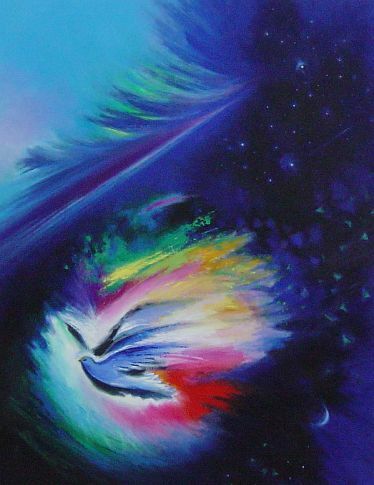 Whenever Japanese artist Yuko Matsuoka paints Christian subjects、 there are three things she keeps in the forefront of her mind: 1) her love of Christ、 2) that a Christian spirit should imbue each piece、 and 3) the importance of color to the impact and meaning of the work. 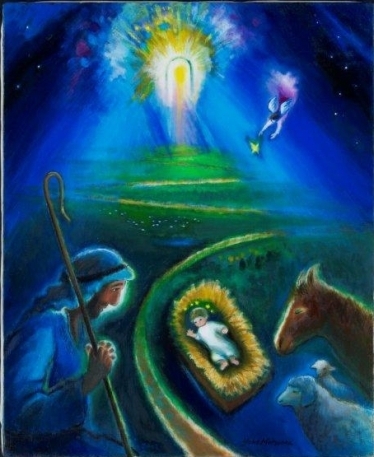 This painting of Christ’s journey to Emmaus is the first of four paintings Yuko has produced on the subject. The second work was featured on ArtWay in 2012. A gifted colorist、 Yuko worked as an interior designer in the US and Japan even as she continued her studies in art. 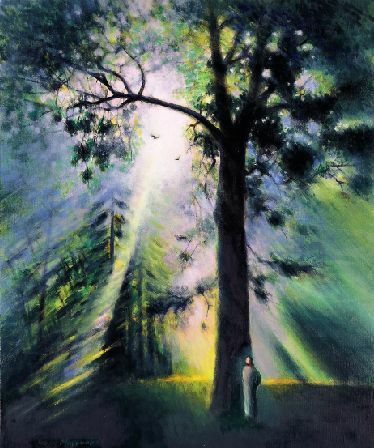 While many artists have depicted the road to Emmaus in a barren setting like wild dry fields using a somber、 monochromatic palette、 Yuko sets it in a delightful green place. The vibrant jewel tones of the stained glass of Chartres Cathedral deeply influences her use of color. But the greens in this painting may be specifically attributed to the influence of her first private art teacher (Shigehiko Ishikawa)、 an outstanding artist who was known for the beautiful greens of his paintings. It was from him that she、 too、 came to love green and to incorporate them in her paintings. According to Luke’s account in chapter 24、 after the discovery of Jesus’ empty tomb by the women two of Jesus’ disciples were walking to a village called Emmaus、 when Jesus joined them as a fellow traveler and the disciples were kept from recognizing him. When they arrived in the village as evening approached、 the disciples constrained Jesus、 asking him to remain with them at an inn. At the supper table the disciples saw Jesus take the bread; he blessed it、 broke it and gave it to them. Their eyes were opened、 and they knew him; and Jesus vanished from their sight. And they said one to another、 “Did not our hearts burn within us、 while he talked with us by the way、 and while he opened to us the scriptures. 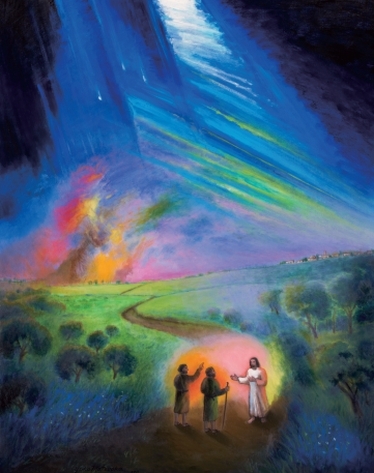 In this painting Yuko wanted to describe the scene of the hearts of the disciples burning within them while Jesus talked to them、 so she painted the disciples bathed in warm color emanating from Christ to represent the illuminating nature of their spiritual conversation. By backlighting Jesus、 she indicates the way the disciples’ eyes were metaphorically blinded so that they could not see clearly who he was. The verdant green light rising up behind Jesus signals the new life made possible through his death and resurrection. 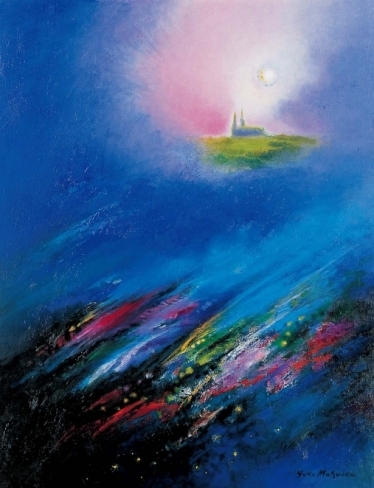 And the glimpse of three stars that appear against a deep blue sky in the upper left corner indicate the impending evening when Christ will reveal himself to them. Yuko has said that whenever she undertakes to depict Jesus she struggles with how to express him as the Son of God who is not only divine but equally human、 experiencing genuine affection. 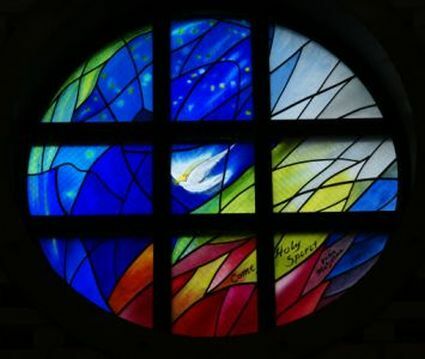 When Yuko finds herself comparing her work to so many great Christian artists、 she often feels discouraged and small、 an experience that may be shared by other artists of faith. But in these moments of discouragement、 Yuko reminds herself that her work and the beauty it hopes to convey are dedicated to God. It is this knowledge that gives her the courage to continue to pursue her calling as an artist. Recently Yuko received two pieces of news that testify to the power of art to imbue spaces with a sense of God’s presence and love. The first is from the Toyo Eiwa Girls School kindergarten. 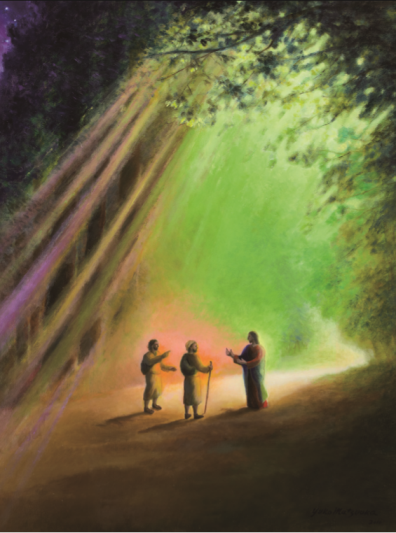 Soon after her painting of the road to Emmaus was placed in the hall、 a couple of the parents became Christians noting the impact of the distinct spiritual air they found in the kindergarten. 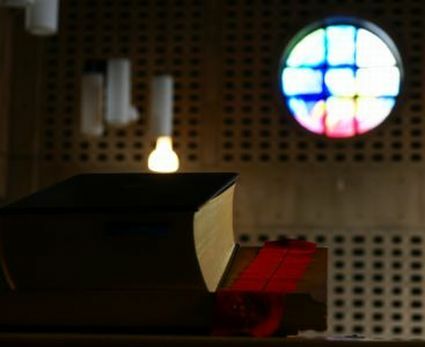 The second is from the college library which reports that since her work Come Holy Spirit was hung on the center wall more students come to study at the library. 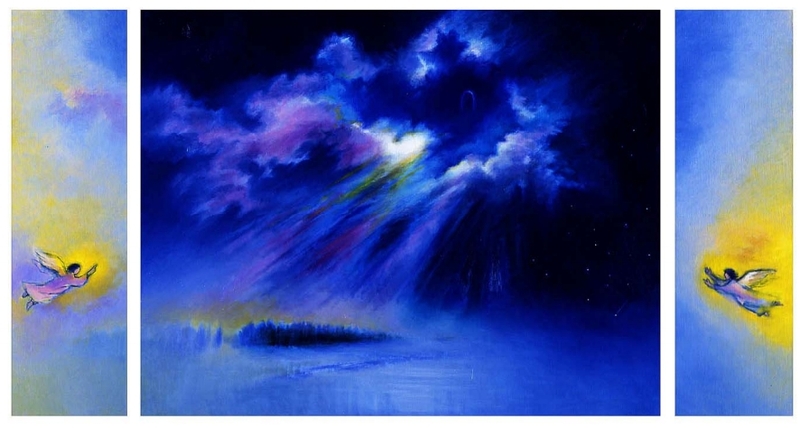 These events have provided Yuko with the encouragement and power to continue to paint Christian themes. 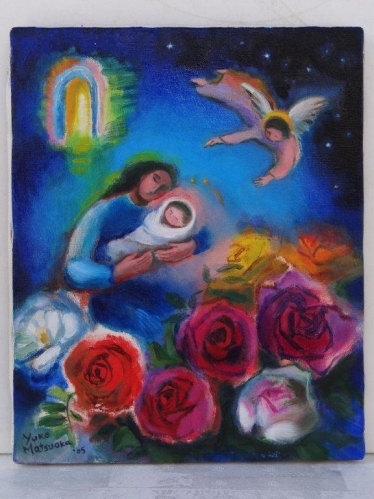 ＜羊飼いに手を振る幼な子イエス＞ 2002 oil 60.0 x 50.0 cm　Inspired by The Childhood of Christ by Berlioz. 東洋英和女学院小学部所蔵 Purchased by Toyo-Eiwa Elementary School，Tokyo. ＜小さい子供が眠るとき…＞ Inspired by my favorite children’s hymn.